Help other people make interactive tutorials. Work on projects that lead to tutorials, instead of starting with the tutorials. I met several people working on interactive tutorials / explorable explanations, and chatted with many more online. It was great to talk to other people making these kinds of tutorials! I was a mentor for Google Summer of Code, working with a student on interactive diagrams for Russell & Norvig's AI textbook, AI: A Modern Approach. He made the diagrams for chapter 3, chapter 4, and chapter 6. After the summer was over, I helped other students make diagrams for chapter 2, chapter 5, chapter 21, and chapter 22. I made an interactive tutorial about making interactive tutorials, including a section on how to make “scrubbable” numbers like the ones in Bret Victor's Tangle library. I'm pretty happy with how that went. 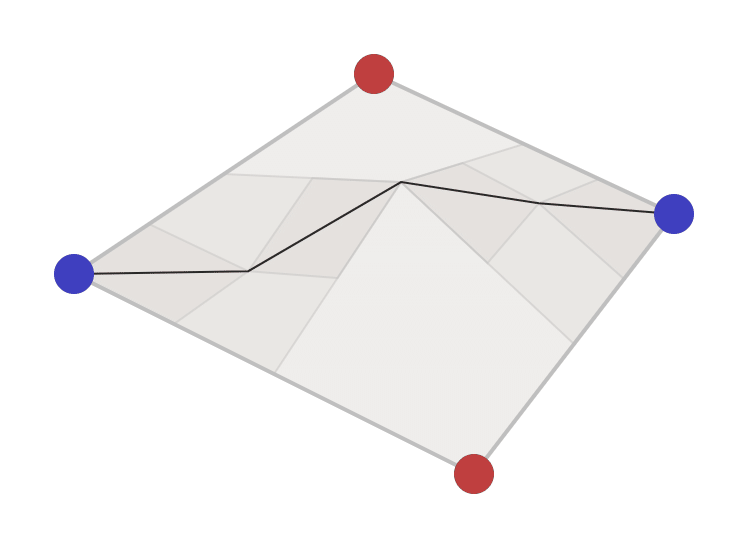 From these projects I wrote a dual mesh data structure library, added a setction about ridges to one of my tutorial pages, and made an HTML5 version of my polygon map generator. Although I did work on many small projects, I didn't work on any big projects. I have mixed feelings about this. I learned a lot from my map experiments this year, and I'd like to produce some useful tutorials and demos from them. Several techniques could be added to the existing map generator. From working with others I was reminded how valuable iteration is. I want to go back to my older tutorials and update them. I want to continue working with game developers on algorithms that could turn into future tutorials. I want to write a tutorial on coordinate systems and cameras. I've tried this before but maybe the third time's the charm? I'd like to write a few more tutorials about writing interactive tutorials. I want to become faster at writing tutorials. Part of this is managing scope but part of it is using better libraries that let me reinvent less each time. In my last post I said I was going to update my website layout. I've been working on it for the past three weeks . The main change is responsive design: the page will adapt somewhat to the size of the browser window, including phone and tablet sizes. Of approximately 600 web pages, I have 514 converted to the new layout. The rest are either unimportant or impractical to convert. I wrote up my notes about how I made the pages responsive. I also fixed some glitches on my pages, and switched from downloaded fonts to system fonts (to make the page load faster). I'm (finally) setting up https. This has been more of a pain than I expected. I think I have OSCP working. I didn't set up ECDHE but may have that. I didn't set up DHE or ECDH. No POODLE or BEAST. Somehow got P-256. I have PFS. I'll do HSTS later. Didn't set up HPKP but it may be obsolete anyway. Can't set up CAA with my DNS provider. No RC4. I have ALPN, NPN. I have CORS. Don't need SRI. I have XFO and XXSS. I have CSP but don't like it. I'm also updating my internal links to link to the https version. I'm (finally) learning responsive design. I have pages going back 27 22 years and I've been making layout changes less and less often. Every time I change something it takes a while to go back through all my pages to make sure it works on all of them. My older pages like polygon map generation are designed for a 400 450 pixel width. I had designed that layout to support desktop computers back in the 1990s. As I worked on more visual pages the 400 450 pixel width seemed limiting so I designed newer pages for 600 pixels. For mobile, I told the phone to treat the page as 640 pixels wide, and scale it to fit. I haven't updated that layout in years. I experimented with wider layouts for the probability page and the hexagon page (both pages switch to a two column layout when the browser is wide enough) but for the most part I've tried to stick to the 600 pixel width. It's simple. It works. In the past few years browsers have quickly added features like flexbox, grids, calc(), scaling of images, and high-dpi. I've seen some neat layouts using these features, and it would let me do several things I've wanted to do but couldn't figure out. 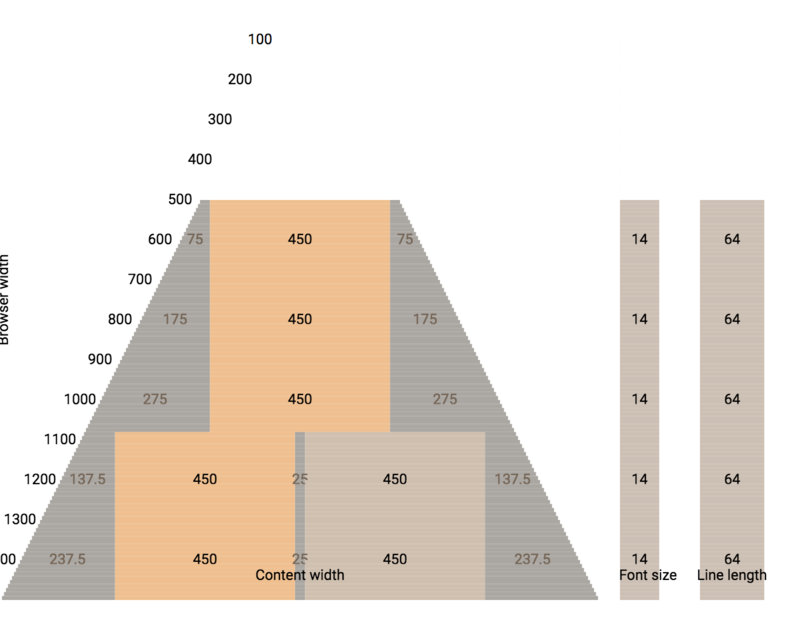 I want more flexibility in my page design than a single 600 pixel column. Lots to learn! I'm also strongly considering dropping custom fonts. I don't think they're adding that much right now, and they slow down page loading. I'm also considering using serif. Back in the 1990s serif fonts were a poor choice, as screen resolutions weren't high enough to render them nicely. But today? After a decade of 1024x768 there's been a sudden increase in screen resolutions / density, so I should consider serif fonts. Seven years ago I worked on an terrain generator for a game called Realm of the Mad God. We had started out using Perlin Noise for height maps but found that most of the maps we generated weren't a good fit for the game. I spent the summer trying out ideas for making the maps, and discovered that Voronoi Diagrams could form a good “skeleton” for making maps. The combination of Voronoi polygons and Delaunay triangles gave me places for quests, towns, rivers, and roads. 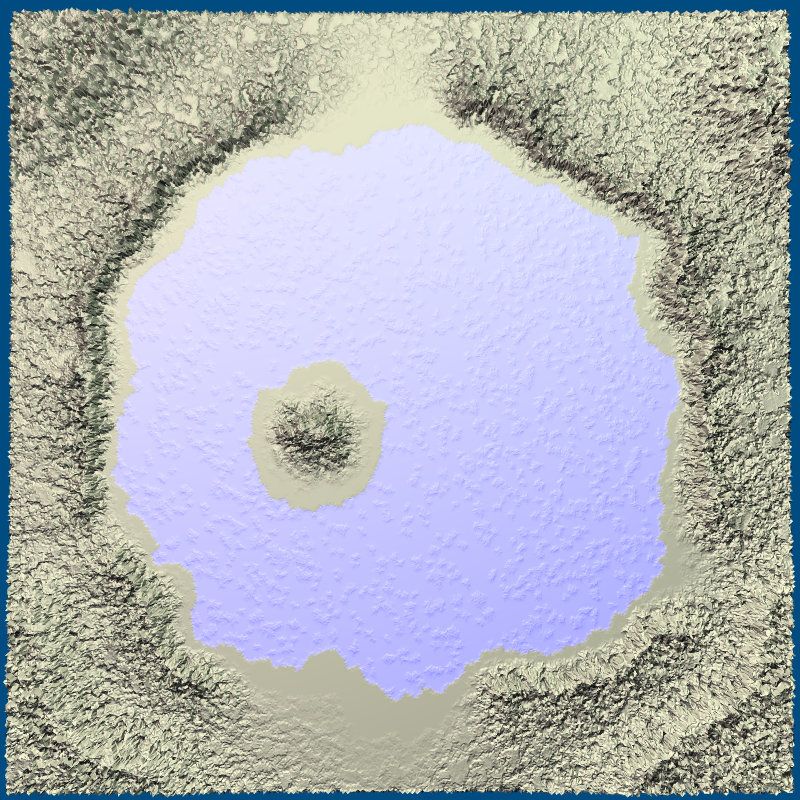 I used Perlin Noise for the coastlines instead of for the height map. The resulting maps were unrealistic and inflexible but they were just what we needed for our game. I'm a fan of sharing math and algorithms so I wrote up my notes in an article titled Polygonal Map Generation, along with a free online demo written in Flash. The response was amazing! I saw lots of projects trying out Voronoi diagrams for their own map generators, and I also saw lots of people using my Flash version to make maps for things like D&D campaigns, stories, and worldmaking. A year later I decided I should spend a lot more time making interactive tutorials, so I started Red Blob Games, where I've written interactive tutorials on probability, pathfinding, and hexagons. Voronoi alternative - I discovered that my map generator from 2010 wasn't actually using Voronoi! I had been using Voronoi during the summer while working on the generator and also while writing the tutorial, but towards the end I tweaked the polygons to improve the rivers, and in doing so I was no longer using Voronoi. Triangle meshes - In 2010 I had used an array-of-structs approach to storing the map data, with an explicit graph structure. It used approximately 2700 bytes per triangle. After watching Gino van den Bergen’s GDC 2017 talk, “B-rep for Triangle Meshes”, I learned about more efficient data structures, and wrote one that uses approximately 27 bytes per triangle. That's a 99% savings! I also learned how to eliminate a common source of errors in my 2010 code: edge cases (literally). By wrapping the map around the "back", I can get rid of all the null pointers in the data structure, and the code became much cleaner. 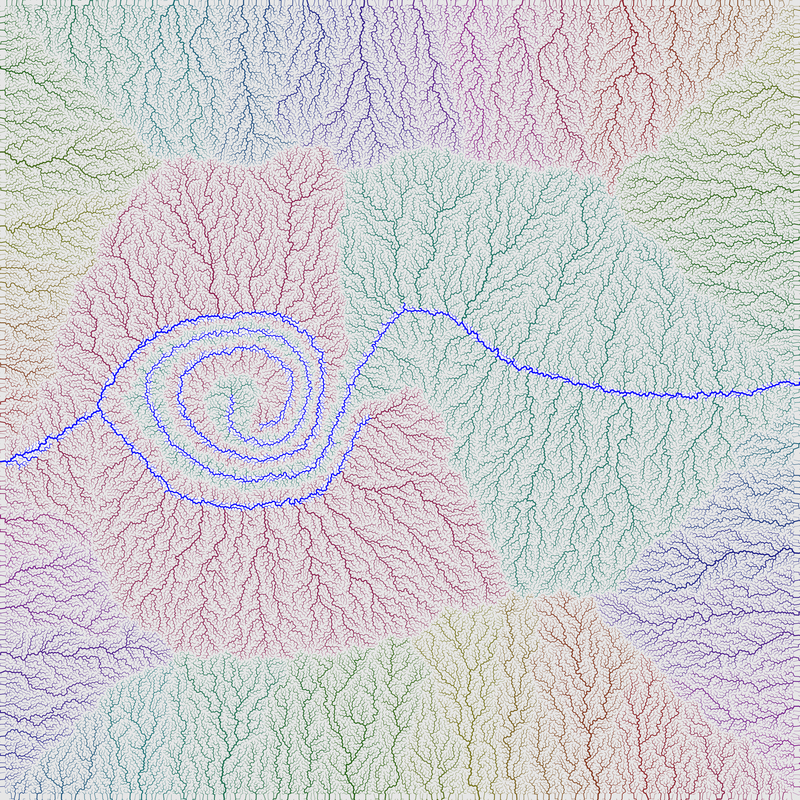 Procedural river drainage basins - Part one - I had found a cool paper that described making rivers first and then making mountains to match the needs of the rivers. I wanted to try this out! 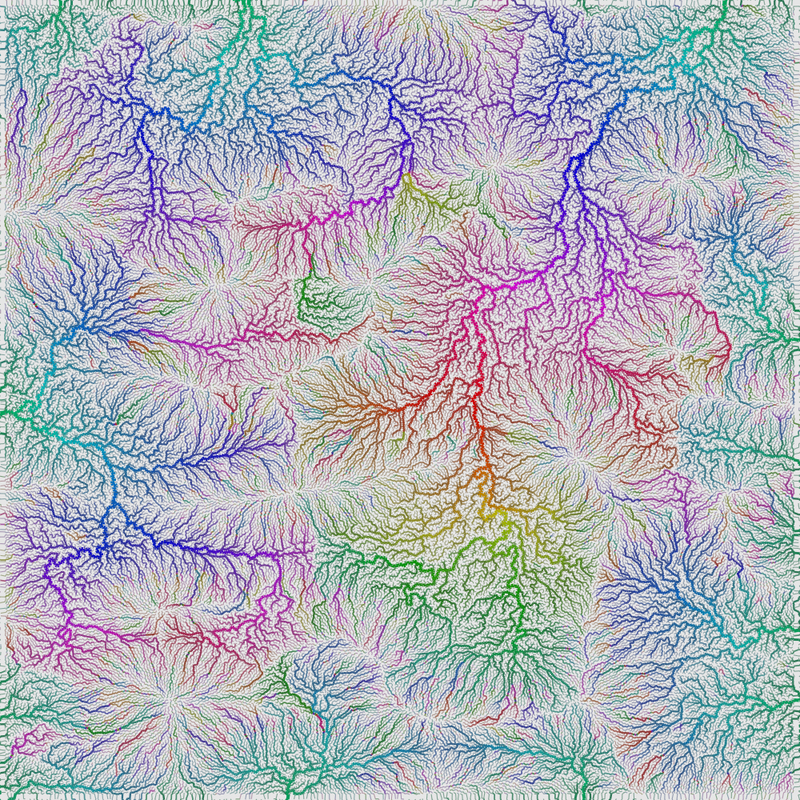 I spent a week playing with rivers and drainage basins. Elevation from rivers - Part two - making the mountains. I ran into some issues that were mentioned in the paper but I wasn't able to come up with a solution within my one week self-imposed deadline. Procedural elevation - Part three - still trying to make mountains, I decided to give myself another week. In working on this I realized I've been pursuing all of this because it sounded cool instead of trying to solve the problem I actually had. I stopped pursuing the mountains-from-rivers approach. Elevation control - One of the problems I was actually trying to solve is giving the level designer some way to influence the terrain generator. 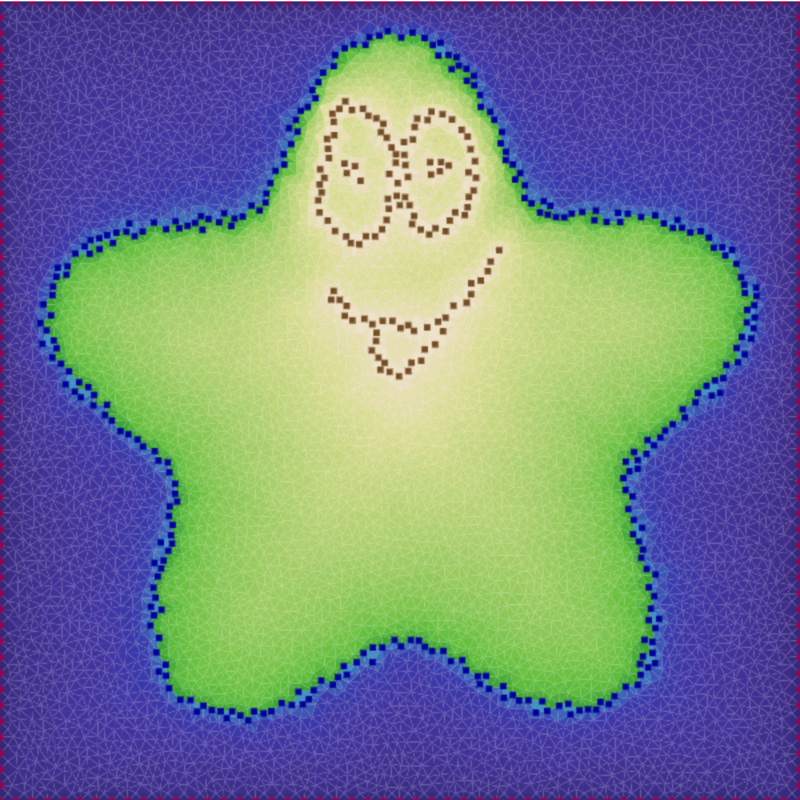 I spent a week playing with some simple algorithms, and found something extremely simple and fast. 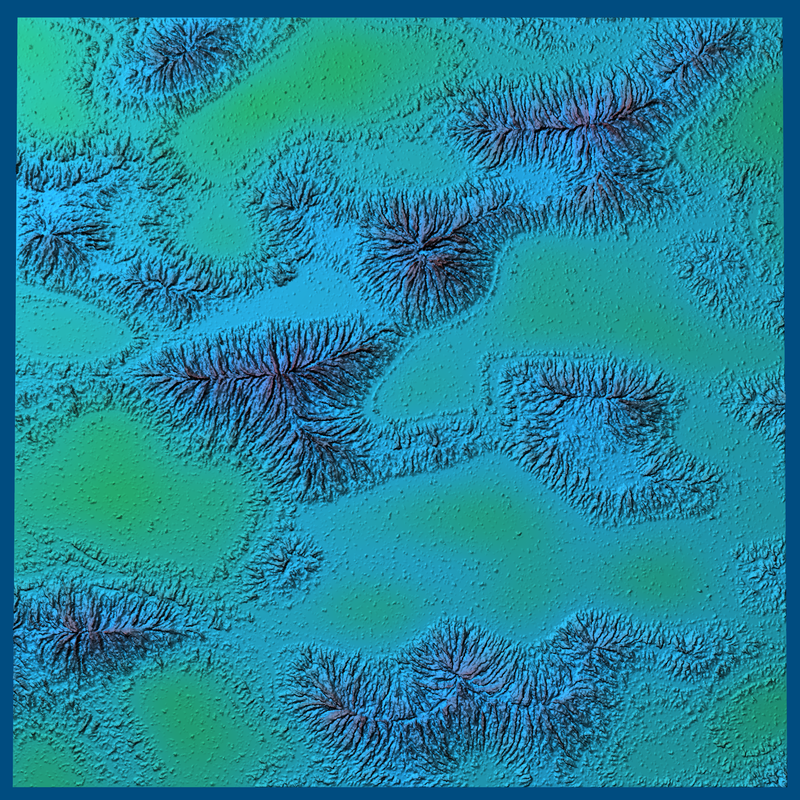 Adding details to sketched terrain - In the previous week I had found something I liked a lot, and I wanted to see if I could hook it up to the mountains-from-rivers algorithms. It was kind of cool but not cool enough that I wanted to pursue it. Terrain shader experiments - I took a break from terrain generation to play with shaders. I wanted to see whether shaders could be useful for drawing the boundaries between the Voronoi polygons. Using barycentric coordinates, I got some cool effects, but the only one that was simpler with shaders than without was noisy boundaries. Having time to experiment was great. I learned a lot. I wrote lots of quick & dirty code, most of which I'll never use again. A few parts of it I want to use for future projects, so I went through those parts and cleaned up the code, ran some automated tests, and then improved the design and usability. One of the things I've been wanting to do for some time is rewrite the tutorial with interactive diagrams, and reimplement the 2010 map generator from Flash to HTML5. Back then, Flash was a reasonable choice, but not so much today. I spent a few weeks on the tutorial but was unhappy with the way it was going, so I put it on hold. 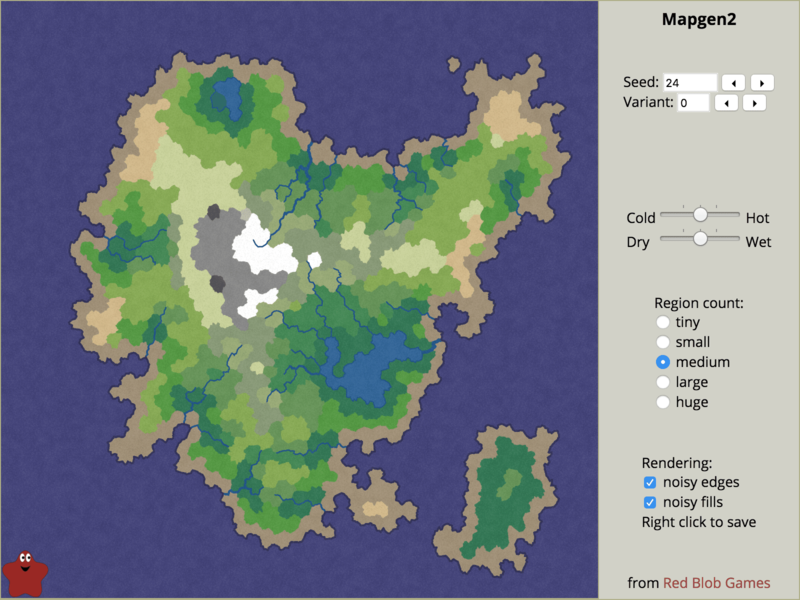 I worked on an HTML5 version of the map generator instead. It doesn't have all the features of the Flash version, but it has some features the Flash version didn't have. It's much faster too. Try out the new version here! I'd like to get back to the tutorial, but I think it'll be more compelling once I have some new algorithms to share. When I wrote about this in 2010, I didn't explain it that well. Now that I'm revisiting map generation, I decided to write a longer explanation. While doing so I studied the code from 2010 and found that it had a bug and also was somewhat convoluted. I decided to use a simpler variant of that, and wrote a page about the simpler variant instead of the original. Here's the description of the algorithm, without code (sorry). If you want to see the code, it's the recursiveSubdivision function. I was pretty happy with the sketching tool from last week but I wasn't sure whether it actually produced the data I needed. I connected several separate projects together to make the sketching tool guide the generation of rivers and elevation. These projects weren't coded to work together, so the page is rather clunky, but it served its purpose. 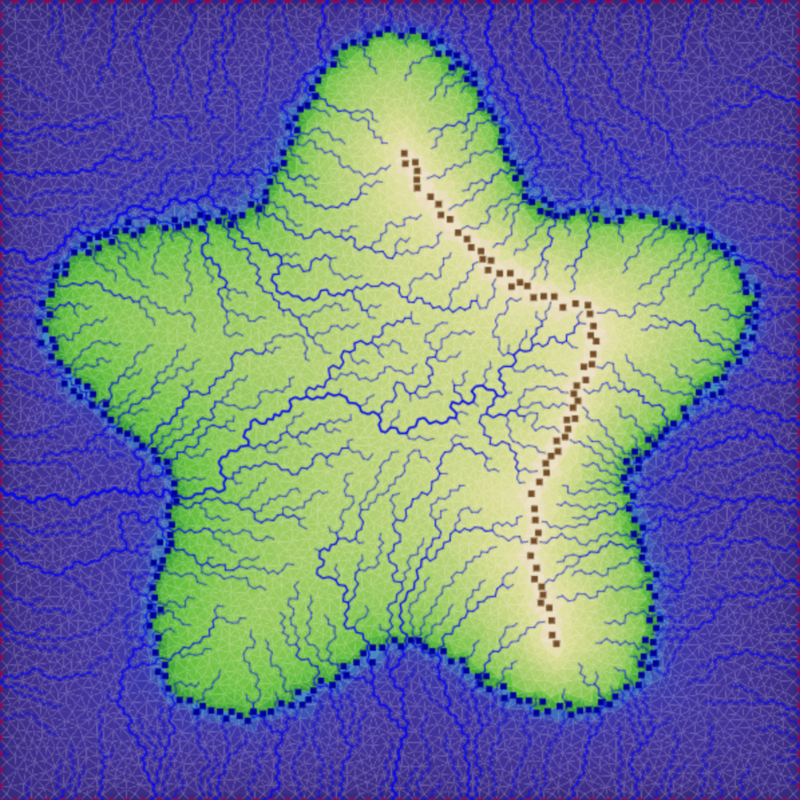 I found that the sketching algorithm needed some tweaks, and the river and elevation algorithms need some tweaks too. 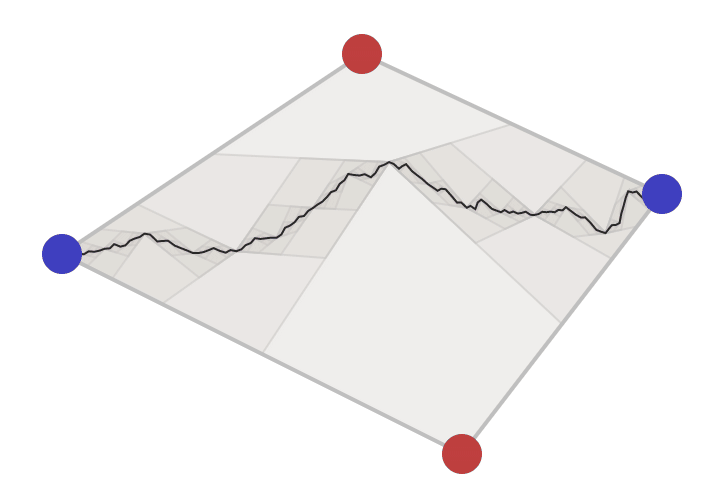 I also extended the sketch demo to let you change the boundary points, which have elevation -1. By default they're at the borders of the map. By removing them from the borders you can get non-island maps. 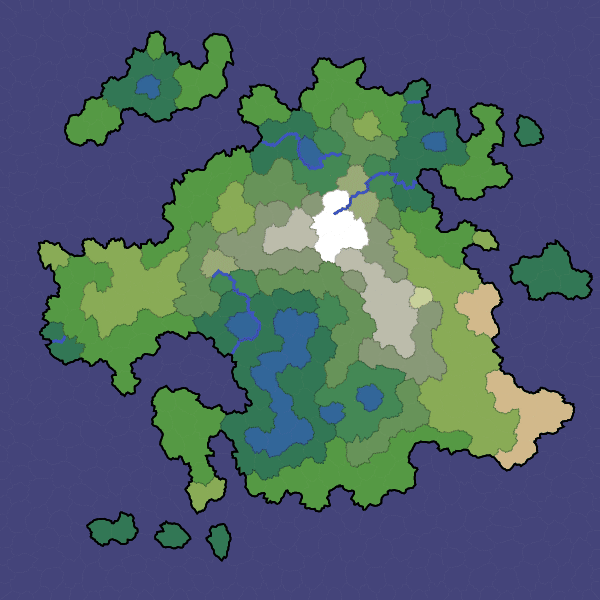 By adding them elsewhere you can generate lakes. The main reason I put the previous experiments on hold is that one of the major goals for the current project is for the game/level designers to have some control over the procedural generation. This week I experimented with a sketching tool that lets you draw mountains and coastlines. It ended up being a fairly simple algorithm that's fun to play with. The demo works on touch devices too. And here's the writeup. Next time — something different! 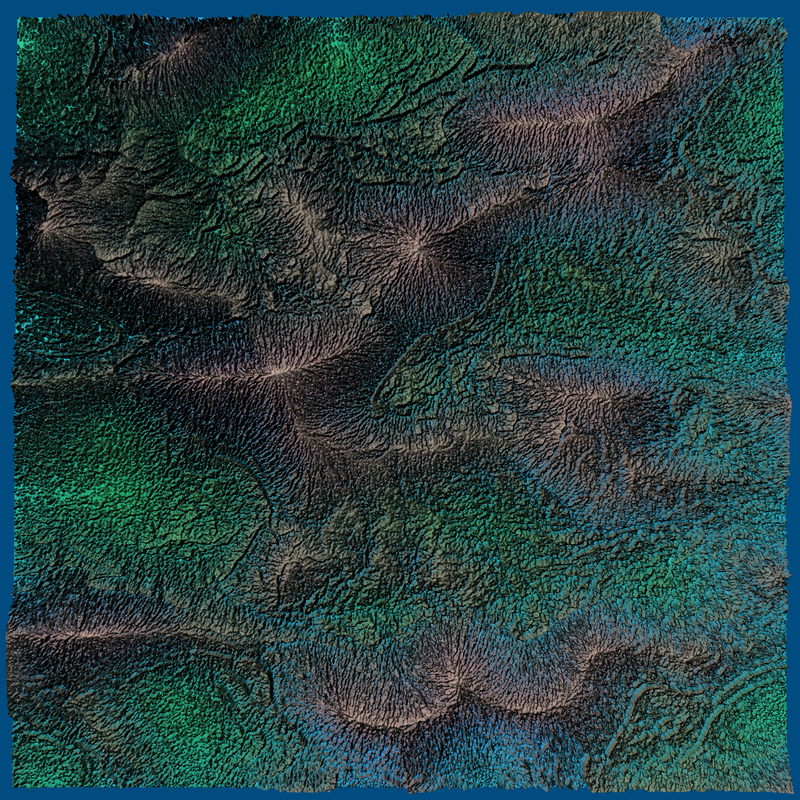 In my polygon map generator from 2010 I built the mountains based on the coastline, then made rivers flow down from the mountaintops. I’ve been exploring a different approach. Last week, I grew rivers up from the coastlines. My goal this week was to build mountains that matched the generated rivers. I wasn’t able to make something that worked to my satisfaction, but I wrote up my notes, and will try again next week. In a normal procedural generator I would start with elevation, then figure out oceans by looking at where the elevation is low. For my procedural generator from 2010, I started with the oceans and then build elevation to match. Working backwards led to some cool maps. I worked forwards for rivers though, making water flow downhill, then calculating river drainage basins. I'm always looking for opportunities to solve problems backwards, so this time I'm trying to make river drainage basins first, then make the rivers flow uphill, then build the elevation to match. This paper is part of the inspiration. I'd also like to be able to place some of the rivers and have the system figure out where the rest of the rivers are. I wrote my notes here. Most of my project use grids. I rarely work with polygon structures. 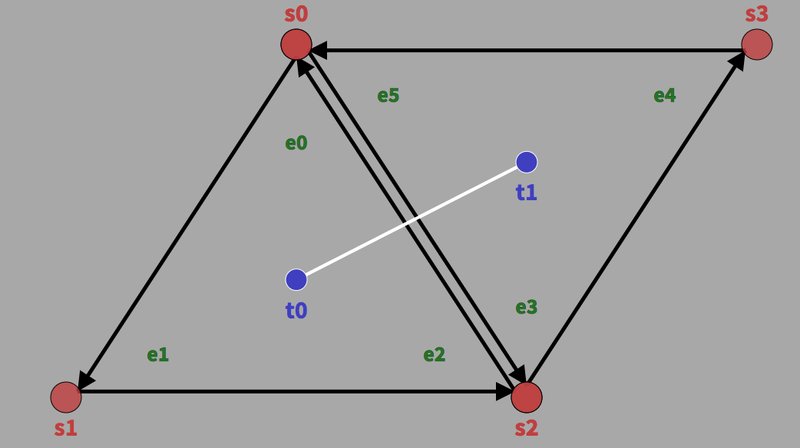 When I worked on my polygon map generator project in 2010, I created my polygons thinking of graphs: nodes and edges. People who work with polygons have better ways of representing them, but I hadn't studied them until now. For my new map generation experiments I'm learning about half edge, winged edge, quad edge, and other data structures. I wrote my notes here. When I think back on my polygon map generator project from 2010, the word I associate most with it is voronoi. I used Voronoi diagrams for spacing the points and also for constructing polygons around those points. Seven years later, I'm revisiting this, looking at the ways in which Voronoi wasn't a perfect match for my needs, and looking for alternatives. I made my own polygons from Delaunay triangles and plan to use this for a future procedural map generation project. People ask me how I write my interactive tutorials. I can point at the HTML+CSS+JS but that doesn’t show the process. I decided to rewrite one of my interactive tutorials from scratch, documenting the process along the way. I originally planned to use a very simple tutorial, but I decided to use line drawing instead. It's a medium sized project for me, with multiple diagrams, multiple layers in each diagram, draggable handles, and scrubbable numbers. I think it covers a reasonable set of the things I use for my tutorials. This tutorial shows how I put everything together. This is an interactive tutorial about making interactive tutorials. Simulated annealing says: start with big steps early on, make smaller steps later on. This already happens with many games, with early development making larger changes and post-launch being smaller changes. Swarm optimization says: explore multiple places at once. Early on, you can prototype many different related games, and then see what works well and what works poorly. Later in development it's impractical to build many different games but you can explore small variants with A/B tests. Genetic algorithms says: explore lots of places at once, randomly mutate them, and make copies of the best solutions. This seems like what the modding community provides. Let them explore many alternative sets of game rules, and then incorporate the best features into other mods or into the base game. Variable neighborhood search says: alternate between making small changes for a while and then making a few big changes every once in a while. This could mean periodic patches and also bigger changes in the form of expansion packs. Graduated optimization says: first optimize a simpler problem, then use the solution to simpler problems as a starting point for exploring a more complex problem. This happens in games that start small and grow more complex over time. Are there other techniques you use to avoid your game design getting "stuck" in a local maximum?